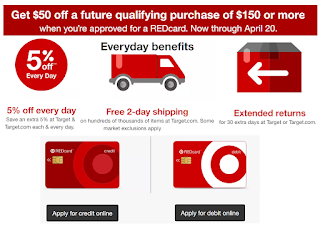 Get a $50 off $150 Purchase at Target When You Sign up For a Target REDcard. Redcard is the Target store card. They have a Debit card that does NOT require credit, it just takes the money straight out of your checking account. They also have a regular credit card you can sign up for. If you shop at Target this is a must have. Perks of the card: You get 5% off on all purchases - even in-store and also you get free shipping online on all orders. You also get Extended return period of 30 days, Extra 5% off Starbucks Target Locations and 15% off Diapers, Wipes and Formula Subscriptions orders. This $50 bonus coupon is an amazing deal for those planning a large purchase or even just a great way to save $50 on your everyday essentials!! COUPON EXCLUSIONS!!! Excludes gift cards, prepaid cards, alcohol, milk, select baby products (DockATot, Halo, Owlet, Peg Perego, Philips Avent), select toys (Barbie Dreamhouse, Fisher-Price Imaginext Jurassic Rex, Hot Wheels Corkscrew Crash, Thomas & Friends Super Station), Elf on the Shelf, LEGO, L.O.L. Surprise House, Bose, JBL, Sonos, Apple, Fitbit, Tile, Google Home/Mini/Max, LG OLED TV, Samsung TVs, GoPro, DSLR cameras & lenses, mobile contracts, Nintendo hardware and Switch games, PS4 hardware, Xbox hardware, Red Dead Redemption II video games, Vitamix, Weber, Traeger, Tylenol pain relief, clinic & pharmacy, and Target Optical.